Looks good. A tome, which means Whitton Greene can find it for you - and she's a pretty good choice of target to attach it too given the toughness and booster to give a chance of winning a story on defence. As an attachment there's always some double jeopardy, but being searchable and Misk having ways to get it back make it a fairly stable one. 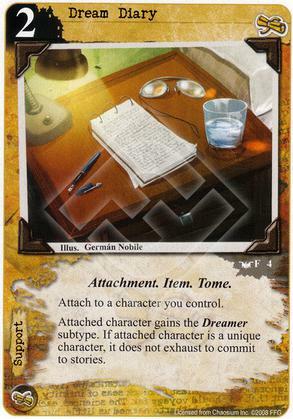 It's ok, the dreamer subtype isn't very useful in MU with the only in faction synergy being dreamlands scholar. That means you want to put this on a unique character to get the full benefit of the card and an attachment that only goes on a subset of characters in your deck isn't very good. The tome subtype is one of the best things about this card although not having a triggered ability reduces the synergy. I've seen worse. The effect is okay (analogous to winning an extra arcane struggle), but adding Dreamer onto a character doesn't do a ton. More of a metagame call than anything, since you have better cards to play if you're only using the effect.